This creamy mocha hot chocolate features a secret ingredient that makes it luxuriously thick while being dairy-free! Freshly brewed espresso adds a delicious flavor that takes it over the top. Once upon a time I thought I didn’t like hot chocolate. Ridiculous! Growing up I wasn’t a picky eater by any means, so the fact that I’d pass up a sweet and chocolatey dessert beverage makes no sense whatsoever. Thankfully I’ve seen the light on how delicious and satisfying a mug of hot chocolate can be when the temperatures cool down, and I think it’s safe to say that I’ve more than made up for lost time. I’ve been thinking about fall and winter entertaining now that fall is solidly here. 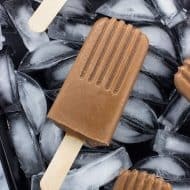 Whipping up a batch of hot chocolate is a cozy way to welcome visitors in the cooler months, as you can easily customize the number of servings or flavorings. 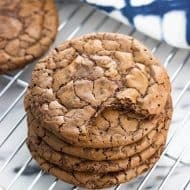 My parents are frequent visitors as they finally live within driving distance, and we already have planned a few visits for baking holiday family recipes and continuing on with wedding planning (just about six months to go)! 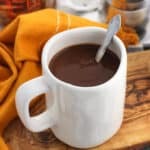 Because my mom doesn’t eat dairy, I knew I wanted to create a dairy-free hot chocolate recipe to surprise her with that’s as thick and creamy as any version. We’re a family that loves food, so making sure all of my guests feel included when they’re here to visit is super important to me as a hostess. I used Silk® Vanilla Almondmilk in this SUPER thick and creamy mocha hot chocolate recipe and totally wowed the whole crowd – those who eat dairy and those who don’t alike. 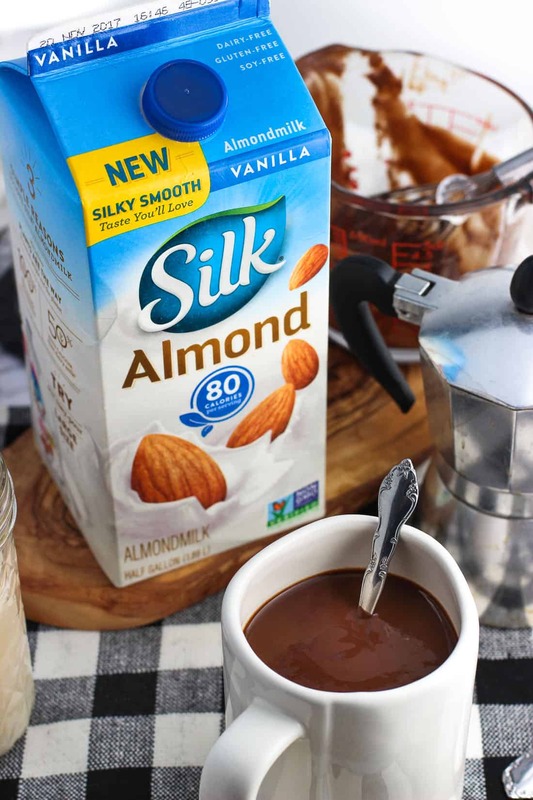 Silk® Almondmilk has a new silky smooth taste you’ll love, and is a dairy-free, lactose-free, and delicious non-dairy milk that features 50% more calcium than dairy milk. 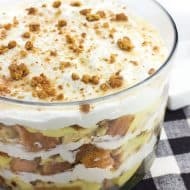 There’s also no cholesterol and no saturated fat, making it the perfect choice to use in your holiday and everyday recipes – both sweet and savory. 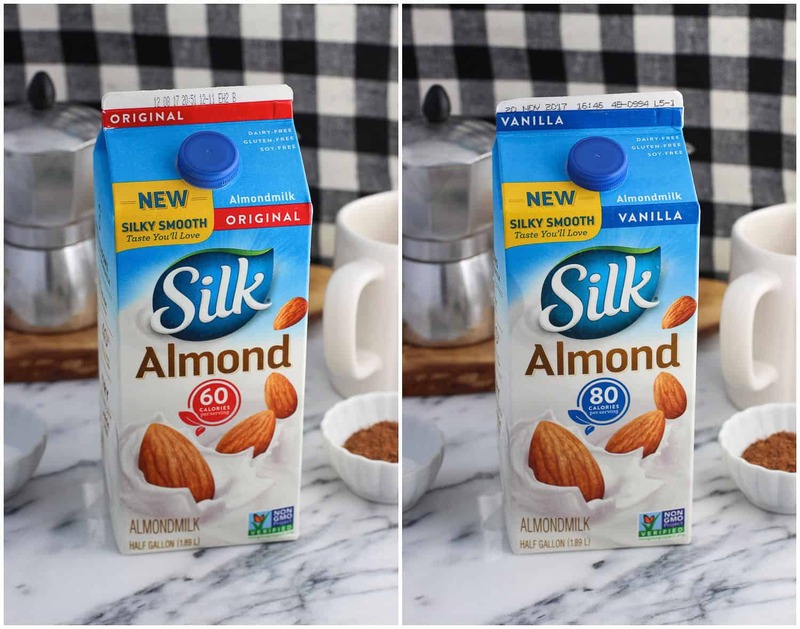 Silk® Almondmilk isn’t ‘nutty’ in taste (or in calorie count!) and makes a great swap in all kinds of food and recipes that call for milk like milkshakes, soups, bowls of cereal, and more. I used Silk® Vanilla Almondmilk in this mocha hot chocolate recipe, but there are a variety of flavors and sweetness levels offered. I regularly swap in the Silk® Original Almondmilk for dairy milk in baking recipes, like my mom’s favorite banana bread. For this hot chocolate, all you’ll need in addition to the Almondmilk are pantry staples like unsweetened cocoa powder, a little bit of sugar, a pinch of salt, and cornstarch. Cornstarch is the ‘secret ingredient’ in this mocha hot chocolate recipe that gets it so thick and creamy. I rarely make hot chocolate without it! 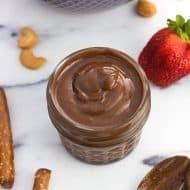 Once most of the Almondmilk is brought to a simmer in a saucepan along with the unsweetened cocoa powder, the sugar, and the salt, you’ll drizzle in a cornstarch slurry made with a few tablespoons of the Almondmilk and whisk for a few minutes while the hot chocolate thickens. This simple step takes hot chocolate to the next level without much effort at all. 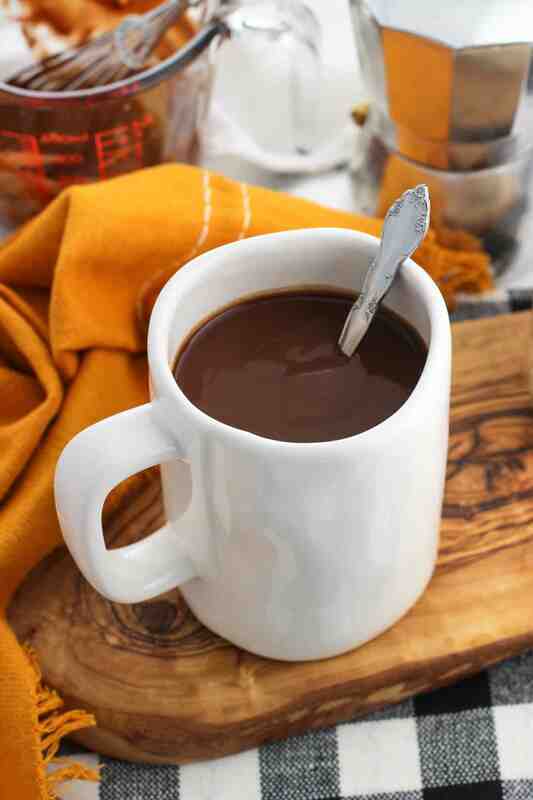 A little cornstarch goes a long way, as this mocha hot chocolate will continue to thicken as it cools once it’s been doled out in mugs. 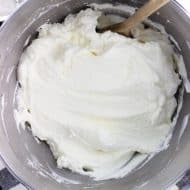 Making a slurry is important instead of simply adding the cornstarch to the saucepan directly because the cornstarch has already been whisked into a portion of the Almondmilk until smooth. You run the risk of clumps if you were to add the cornstarch to the saucepan directly…not exactly a welcome texture in hot chocolate! No need to worry about that with a slurry. A staple of a visit with my parents is an afternoon cup of coffee, tea, or a latte for an afternoon energy boost. Keeping this in mind, I brewed espresso and stirred about a shot’s worth into each mug of hot chocolate. The bold espresso flavor paired SO well with the flavors of the hot chocolate, and was a warming and delicious pick-me-up. If you’re not a coffee drinker you can certainly make this hot chocolate without the espresso, but if you’re a coffee fan, I highly recommend it. 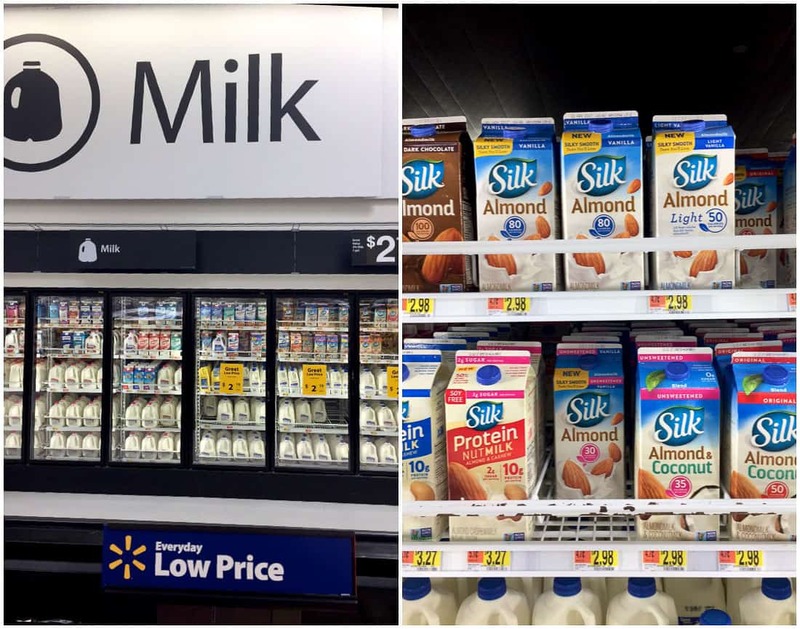 I picked up Silk® Almondmilk on a Walmart shopping trip, where you can find it right in the refrigerated milk section. It’ll be hard to miss with that huge sign! 😉 And take a second to check out Silk® on Facebook, Pinterest, and YouTube for new product news and recipe inspiration. 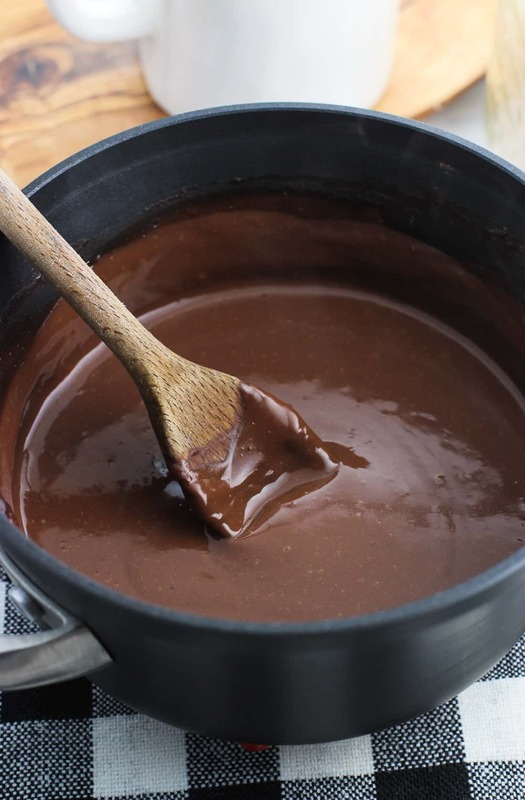 Whisk together unsweetened cocoa powder, sugar, and salt in a medium saucepan. 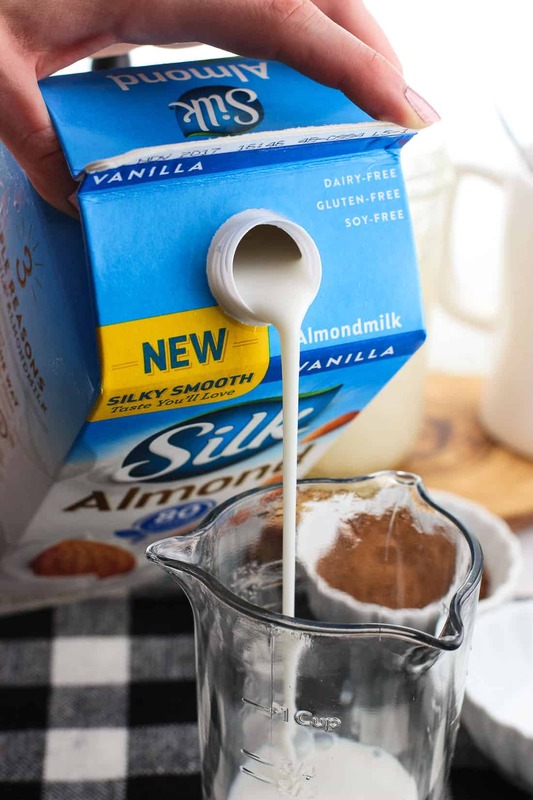 Pour in 1 1/2 cups of the Silk® Vanilla Almondmilk and whisk until combined and smooth. Place saucepan on the stove over low-medium heat and cook until simmering, stirring occasionally. Meanwhile whisk together remaining 2 tbsp of the Silk® Vanilla Almondmilk and the cornstarch in a small bowl to create a slurry. Once simmering, slowly pour the slurry into the saucepan, whisking constantly, until all combined. Continue to simmer the hot chocolate for a few minutes or until it's to your preferred thickness, taking into account that it will thicken some as it cools. Pour into cups and pour in brewed espresso and stir in to combine. If this mocha hot chocolate thickens up a bit too much if you let it sit for some time, simply give it a stir and it'll be good as new. This recipe yields about two mugs of hot chocolate, so increase the ingredients accordingly to serve a larger crowd. I am allergic to soy it does not agree with me can I use evaporated milk? Hi Mary, the Silk Vanilla Almondmilk I used here is actually soy-free! 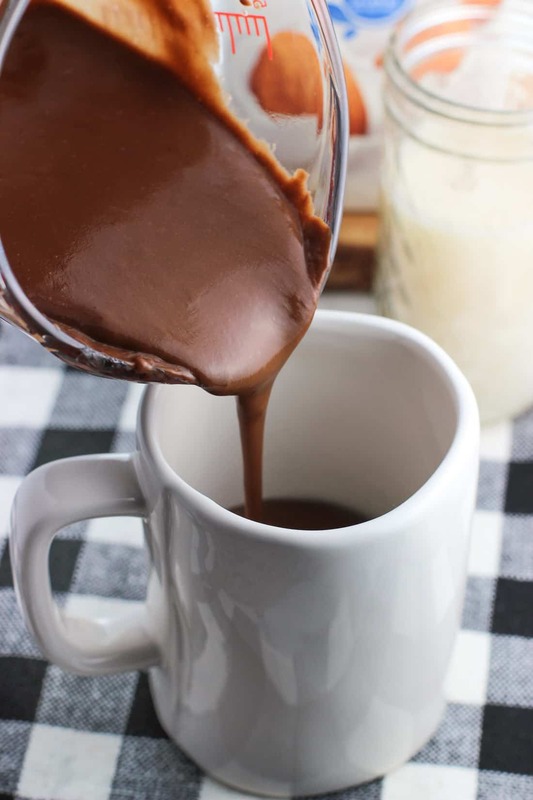 I’ve never made hot chocolate with evaporated milk, but you can use your preferred milk for this recipe. The cornstarch is the shining star as far as thickening it up. I hope that helps!